Here's a little taste of what you can expect from the second installment of openDemocracy's Discourses series, Financial Crisis and its representation, opening this Thursday, July 8th at 6pm. There are a few moments during a crisis when a people’s façade breaks away and admissions of cold and brutal truth are made. Such an occurrence happened in 2008 during the melt-down of the global financial system when Alan Greenspan was called to testify on Capitol Hill and admitted that his view of the world, the ideology which he had championed for decades, was wrong and that regulation of the financial sector could have staved off the Financial Crisis. It’s in moments like these, when the discourses that maintain the status quo shatter, that opportunities for real and meaningful change present themselves. However two years down the road we find ourselves in much the same situation: the majority of the people and institutions who directly caused the crisis are still in power, economic recovery is moving slower than anticipated and world leaders still cannot agree what, if anything, needs to be done to safeguard against the next crisis, a crisis which President Obama warns may be just over the horizon. So what went wrong? Why have people not been able to enact meaningful change, choosing instead to sit by and angrily watch as the old status quo returns? Perhaps the problem is not just that a few greedy bankers are causing the total collapse of the world’s financial system just so they can get rich, but that the system itself is broken. Maybe the ways we are taught to understand economics are inherently flawed and new mechanisms of analysis need to be developed that account for and explain instability and irrationality? However the silver lining to all this is that more and more people are asking these questions. The notions that finding new ways to understand economics is not only the responsibility of policy makers, businessmen and bankers, and if we are ever going to create safeguards against future crises, a better understanding of how the financial system works (or doesn’t work) is an important task for everyone to undertake are starting to spread. It is precisely these questions which the second instalment of openDemocracy’s new Discourses series will address this Thursday, July 8th at the Drawers Gallery (438 Kingsland road, E8 4AA in the London Borough of Hackney) with our Financial Crisis and its representations event. Come join us for an open discussion with the lecturer in International Political Economy at the Centre for International Studies and Diplomacy and former economic adviser to the Venezuelan president Hugo Chavez Stephanie Blankenburg; journalist, social theorist and lecturer in economics at the Anglo-American University in Czech Republic Nikola Ivanovski; and the novelist, writer, poet, economist, artist and visiting Research Fellow at the University of Westminster’s Centre for the Study of Democracy Nitasha Kaul as they explore new ways of examining and understanding global economics. 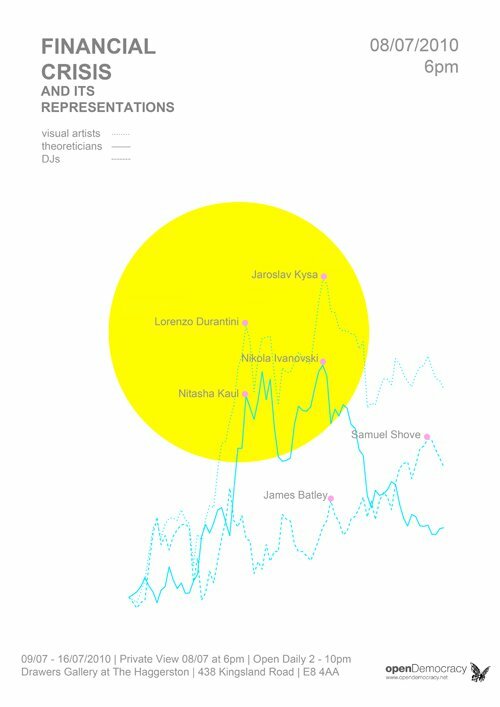 The event will also feature an exhibition by artists Lorenzo Duranitni and Jaroslav Kysa exploring visual representations of the Financial Crisis. The event will open at 6pm, with the discussion starting at 7:30. And, unlike most things in this economic climate, it is free to all!